Claude Monet, also known as Oscar-Claude Monet or Claude Oscar Monet (November 14, 1840 – December 5, 1926) was a founder of French impressionist painting, and the most consistent and prolific practitioner of the movement's philosophy of expressing one's perceptions before nature, especially as applied to plein-air landscape painting. The term Impressionism is derived from the title of his painting Impression, Sunrise. "It's on the strength of observation and reflection that one finds a way. So we must dig and delve unceasingly." A founder of Impressionism, French artist Claude Monet strongly influenced landscape painters with his portrayals of the effects of atmosphere, time and season upon light and color. His groundbreaking work digressed from established techniques of depicting the natural world. Specifically creating a garden at his Giverny home for the purpose of painting it, “Artist’s Garden at Giverny, 1900” is an ethereal interplay of hue and daylight. ¹ Complete Bio @ Wikipedia. Claude Monet: Sunshine and Waterlilies: Sunshine and Waterlilies (Smart About Art); Claude Monet - 1840-1926: a Feast for the Eyes; The Unknown Monet: Pastels and Drawings (Clark Art Institute); Monet's Garden: Through the Seasons at Giverny, Harry N. Abrams; Claude Monet - 1840-1926: a Feast for the Eyes by Karin Sagner; Claude Monet: Life and Art by Paul Hayes Tucker; Claude Monet: The Magician of Colour (Adventures in Art); Monet: Impressions of Light (Great Masters); Claude Monet, 1840-1926, Taschen; Monet Art Institute of Chicago (Artists in Focus), Harry N. Abrams; Monet in the 20th Century, Yale University Press. 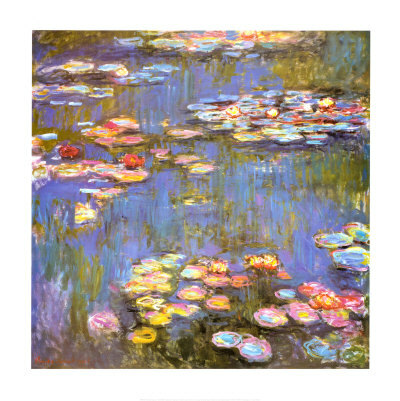 Available here are these Claude Monet posters and prints, among others: Nympheas, Sunset In Venice, Impression Sunrise, Water Lilies At Giverny 1908, San Giorgio Maggiore at Twilight, Chemin Dans Les Bles a Pourville, Irises, Water Lilies, Le Pont Japonais a Giverny, Cliff Walk at Pourville, Jardin De Giverny, Dusk, The Artist's Garden at Argenteuil, Soleil Levant 1873, London Houses of Parliament, Antibes, Monet's Garden, Poppies, Sunlight Under The Poplars, Sailboats at Argenteuil, Viale Del Giardino.